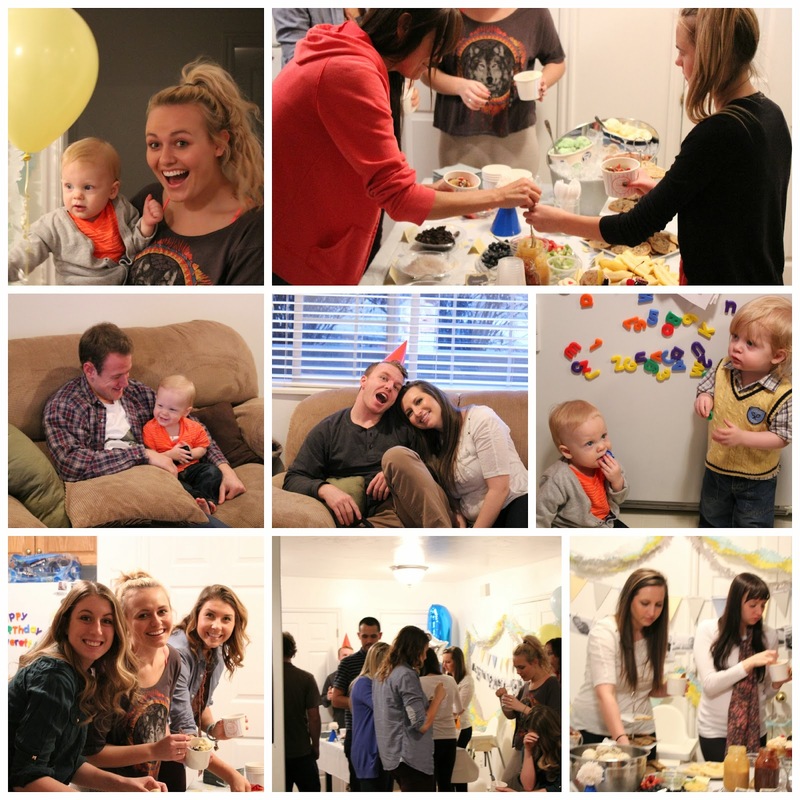 A couple days before Everett's real birthday, we had a little family and friends party for him. We decided on an ice cream party, because Everett loves ice cream and sundae bars and root-beer floats are awesome. 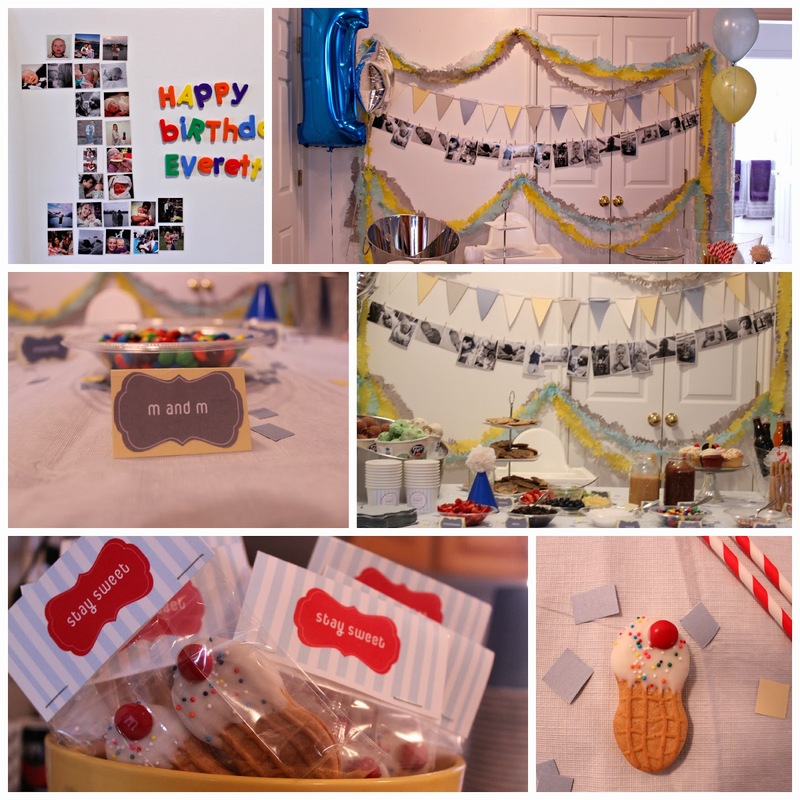 I know that a one year old was not going to remember anything about this party, but I love this kind of stuff so whatever! 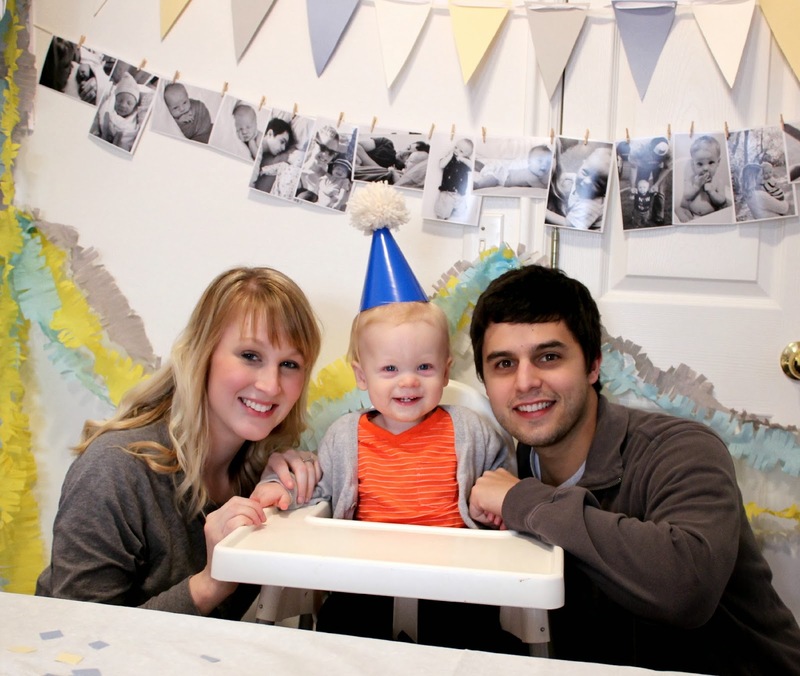 We felt so loved on Everett's behalf as family and friends piled into our tiny apartment to wish Everett a happy birthday and Everett was on cloud NINE with all the attention and singing and hugs and cake! I made all the decorations myself, I am not usually a crafty person, but these mom instincts must be doing something to help me out. I made the fringed garlands using this tutorial. I designed all the printables on photoshop and printed them out and glued them on various things. I got the ice cream cone party favor idea from pinterest using Nutter Butters, white chocolate, sprinkles and a red m&m for a cherry and then got the cellophane bags at the Paper Store. I thought it was pretty clear they were ice cream cones, but apparently they needed a bit more explanation. We had ice cream and every topping you could hope for, including my favorite-homemade chocolate and caramel sauce. Surprisingly though, the gummy worms were the first to go. 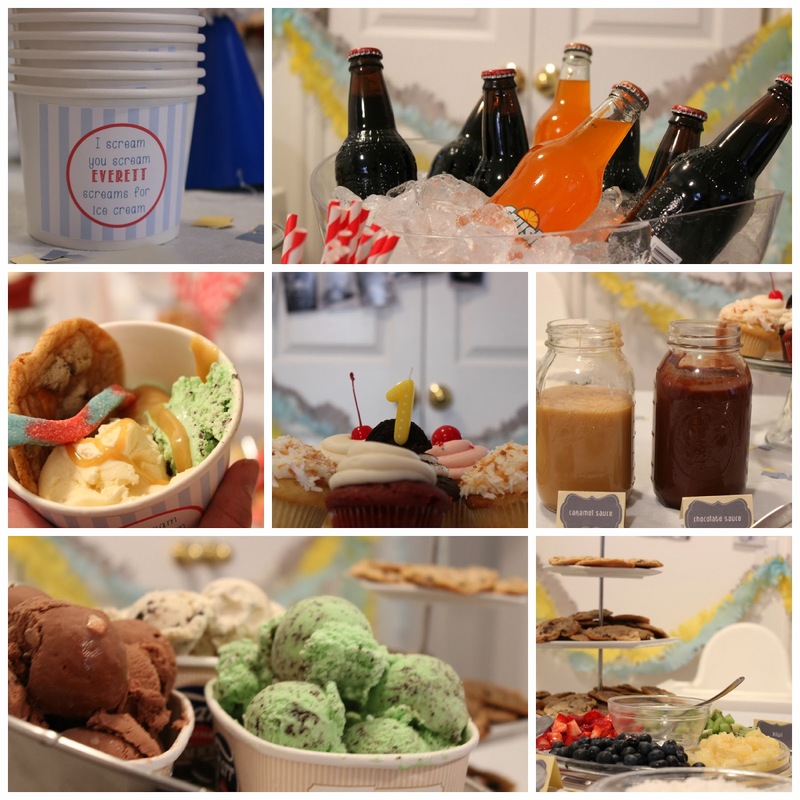 I got made fun of-but YES I pre-scooped the ice cream the night before to make it easier and who likes to sit there and scoop ice cream while a party is going on. (Martha's method here) And of course, IBC bottled root-beer and Orange Crush. My friend Jordan made the delicious cookies that were a huge hit-recipe found here. I found the blank fro-yo containers at Zurchers and then added the labels. My favorite part of the whole night was singing Happy Birthday and watching Everett go to town on his very own cupcake. We all gathered around him in his chair and he could not stop smiling. We sang happy birthday and helped him blow out his candle, then just let him go for it an go for it he did. 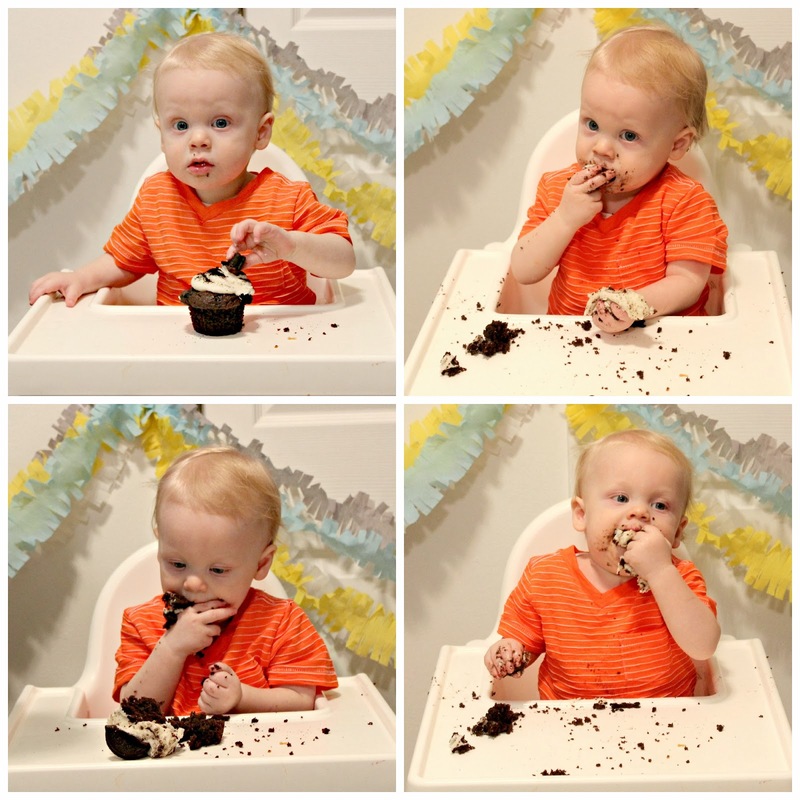 He ate almost the entire cupcake-although he did manage to get a good amount on the floor as well. He loves sweets, so I am pretty sure this was one of his great life moments so far. He squished it between his fingers and stuffed the entire icing topping into his mouth. We were so proud. It really was such a great night. Even after everyone left, Everett was still bouncing off the walls, smiling from ear to ear and ended up going to bed almost 2 hours later than usual. 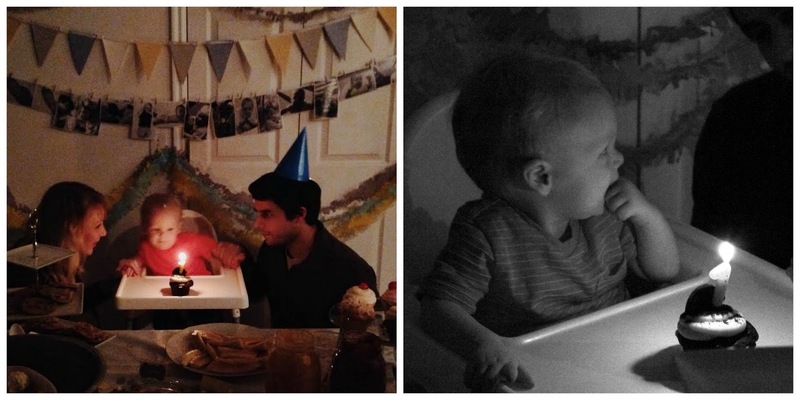 Thanks so much for everyone who came and being such a special part of celebrating Everett's first year!